"I, Garmr! 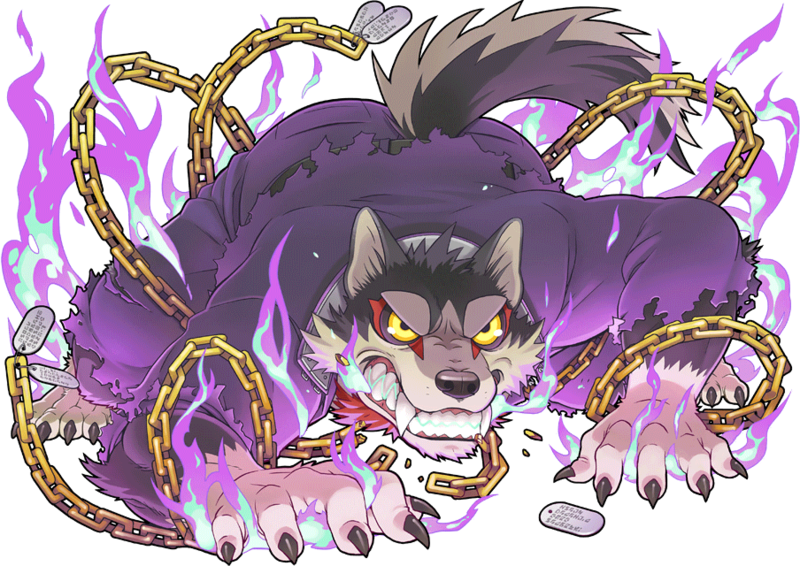 Are you... Garmr's new master?! Ohh!! Hooray!!" "This Transient is not good at thinking too deeply. He is a loyal dog who loves being depended on and thus ordered to do something important. He presently acts as gatekeeper to the Ikebukuro Guild. Because he doesn't think much, he causes a lot of trouble and some abrasive types have taken to labeling him a useless mutt. However, when it comes to holding down the fort, he is a guardian of the highest caliber. He openly displays his hostility toward rival guard dogs of a similar nature." I, Garmr! 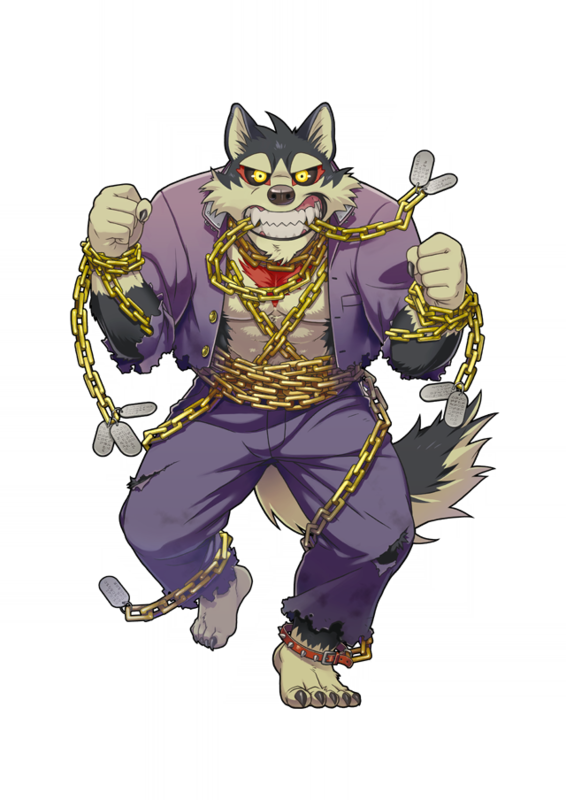 Are you... Garmr's new master?! Ohh!! Hooray!! Master's enemy, gets bit! Garmr, gets praised! Master, can I bite him? Without Master's permission, nobody gets through!! Undying Loyalty, Tiwaz Teiten!! Masteeeer!! Garmr, won!! Pets! Pets!! GARMR, LOVE, LOVE! Want to stay together foreveeeer! A bestial dog man who serves as the watchdog/bouncer to the Ikebukuro Berserkers. He has a "loyal dog" mentality; deep thinking is not his strong suit, and he prefers following orders from a trusted master. His dimwittedness can be troublesome for the Berserkers at times, but he is second to none as a guard dog and will protect his appointed spot with his life. He is absolutely shameless in his jealousy toward another guard dog he views as a rival. "His previous summoner, the Queen of Helheim, gave him his chain but not for the purpose of tying him down. It is, in fact, the coil of an electromagnetic catapult, designed to accelerate his immense power and turn him into a bullet. Though he is inflexible in some ways, there is no-one better to guard any fortress. Back in his home world, he was born and raised as a weapon against the extant War God. He believes that duty to be the greatest act of loyalty he can carry out." His previous summoner, the Queen of Helheim, gave him his chain but not for the purpose of tying him down. It is, in fact, the coil of an electromagnetic catapult, designed to accelerate his immense power and turn him into a bullet. Though he is inflexible in some ways, there is no-one better to guard any fortress. Back in his home world, he was born and raised as a weapon against the extant War God. He believes that duty to be the greatest act of loyalty he can carry out. The Sacred Artifact chains wrapped around his body were given to him by his former mistress, a Netherworld Queen, and are not intended to restrain him. It is more accurate to say he's the wrecking ball at the end of the chain. The chain serves as a Mass Driver, augmenting his already substantial strength and speed, while also providing a comforting reminder of home. Reflecting his role as Watchdog to the Berserkers, Garmr's mythological basis is the guard dog of Hel, the ruler of the underworld in Norse mythology. Even though Defender of Helpers is an After Damage skill, it still reduces the damage taken by your allies during the same attack that activated it. This is likely because, since the user has to be in front of allies for it to work, the damage taken by your allies behind the user is calculated right after the skill has activated. Ahh. I rerolled my account to get a 5* Kamui, and today I did a 10 roll thinking I might get Seth. Got 4* Garmr and Bathym instead, not disappointed. It took 108 days for Garmr to come to me, but I managed to get both of his forms within 24 hours of each other. Fully maxed them that day. i love him he is gay.